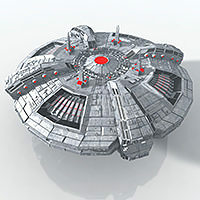 A highly detailed alien mothership. Essential for those sci-fi back drops, close ups and more. The suacer oozes with detail and inspritation form indipendance day & distict 9 this huge original suacer is amazing for animation.